Theee trials to evaluat the potential of alley cropping in maize production on the low fertility, acidic soils in Northern Zambia are described. Leucaena leucocephala, Gliricidia sepium, Sesbania sesban, Albizia falcataria, Fleminga congesta, and Cassia spectabilis, were grown in alley crops with hybrid maize and soybean. All trials received recommended rates of P and K fertiliser; N fertiliser was applied at three rates as a subplot treatment. One trial received lime before establishment. 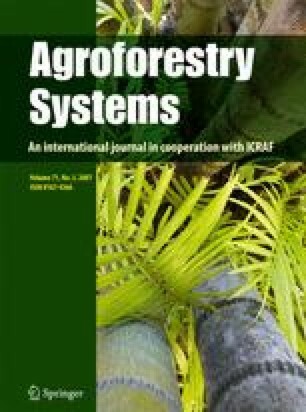 Only in the limed trial was there a significant improvement in maize yields through alley cropping; when no N fertiliser was applied, incorporation of Leucaena leucocephala prunings resulted in an increase of up to 95% in yields, with a smaller improvement being produced by Flemingia congesta. There was a significant correlation between the quantity of prunings biomass applied and the proportional increase in maize yields over the control treatment. It is suggested that the lack of effect of most of the tree species on crop yields was due to low biomass production. An economic analysis showed that alley cropping with limed Leucaena was only profitable when fertiliser costs were high in relation to maize prices. However, lime is both expensive and difficult to obtain and transport for most small scale farmers in the region, and is therefore not a practical recommendation. It is suggested that future alley cropping research should focus on screening a wider range of tree species, including other species of Leucaena, for acid tolerance and higher biomass production.